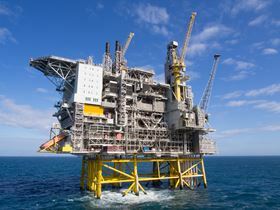 PPG has added Hybon 2732 direct draw roving to its established line of Hybon fiber glass products for applications such as oil and gas platforms. PPG has added three new products to its established Tufrov, Hybon and Innofiberfiber glass product lines. Hybon 2732 direct draw roving fiber glass has been designed to improve the strength of composite structural products made of pultruded fiber-reinforced polymer (FRP). It has reduced profile warping, low process abrasion and lower running tensions and can help improve the processability of continuous FRP shapes and profiles of structures made with constant cross-sections, such as oil and gas platforms, architectural products, ladder rails, cellular and utility towers, and other power-generation and infrastructure applications. It also features better dry roving tensile strength for improved compatibility with unsaturated polyester resins in pultrusion processes, the company claims. Tufrov 4520 roving offers higher mechanical strength and improved long fiber thermoplastic (LFT) processing, especially in hot, humid production environments. It has high tensile strength and improved abrasion characteristics and can reduce downtime and enable the formation of stronger, higher-quality thermoplastics for automotive components, truck liners, aerospace cargo containers, component housings and other applications with high structural requirements. InnofiberTS 2402 direct draw roving fiber glass is a new composition designed to improve sound absorption due to improved volumizing inside muffler cavities for automotive and industrial exhaust systems. Based on the same corrosion-resistant, high-temperature composition as InnofiberCR roving, InnofiberTS 2402 roving is made without boron to increase the glass softening point and mees the performance specifications of global automakers. This story uses material from PPG, with editorial changes made by Materials Today. The views expressed in this article do not necessarily represent those of Elsevier. PPG reports that it will sell its remaining glass fiber operations to Nippon Electric Glass Co Ltd. The Composites and Advanced Materials Expo (CAMX), taking place in Florida, Orlando, has announced the winners of the fourth annual CAMX Award.